CLAT Exam is scheduled to be held in the month of May 2018. If you are planning to appear for CLAT Exam then fill the CLAT Application Form 2018. Application form is available on official website. Generally, a candidate asked when to start CLAT Preparation. As per the experts views, CLAT preparation is best done with six months left for the exam because 1 or 2 months is too less and one whole year might disturb your boards preparation or else one-year preparation means dropping a year which is something that is not recommended. It is to be advised to check CLAT Eligibility before submission of application form. 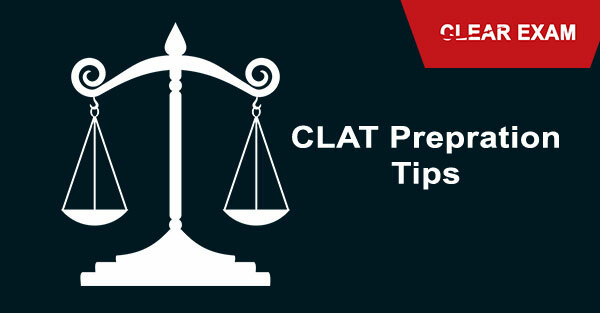 Let us first look at how to balance boards preparation and CLAT preparation. One must dedicate equal hours for both boards and CLAT and hard work alone will do the trick. Studying 10 hours a day is normal and that gives you enough time for both exams. Group studies can help a lot. Both you and your study mate can discuss problems as they arise and compete with each other and this also helps keep stress at bay. With this much hard work and focus and determination one can ace or do reasonably well in both boards and CLAT Exam. Now let's look at where to begin the CLAT preparation. Make up your mind about whether or not you want to join a coaching class and whether you want to go for test series of a good coaching or entirely study on your own. I very much recommend that you join coaching. One should start with GK and for that one should develop a habit of reading newspapers if one does not already read newspapers daily and religiously. Newspapers from cover to cover and with a focus on the editorial section will help with both English and GK. GK is scoring if one is well prepared because there is only one answer and no scope for negative marking. Apart from newspapers, one should subscribe for monthly editions of competition review magazines. For all other subjects, I recommend you get hold of the study material of a good coaching institute. These should be your preparation books. I also recommend Universal Law Guide for quick access to possible questions that might appear in the exam. Make sure you have a mentor at the coaching institute who solves all your doubts. If you have no mentor because you are self studying then YouTube might come to your rescue as there are many videos related to CLAT doubt solving which one can find there. Assuming you are taking coaching then although study material that you get from a coaching institute is usually more than sufficient but if you need books then go for the English book " Word Power Made Easy" by Norman Lewis and English grammar book called " Wren and Martin". The grammar book would come handy while preparing for questions where you have to spot errors in a sentence. English also includes spelling corrections for which you should pick up the Norman Lewis book or a dictionary and read words from there directly. Vocabulary pocket books are an essential tool in case of paucity of time. For Maths and Logical reasoning I recommend the book by the author called R.S. Aggarwal. Legal Aptitude is one of the most scariest section. You must be wondering on how to prepare legal aptitude for CLAT Exam. Legal aptitude is very interesting once you get a knack of it and it is also very scoring. Concentrate on constitution, torts, and contracts as majority of the questions are asked from these subjects. Facts about the preamble, and fundamental rights and duties should be known. Definitions of offences, principles of torts and contracts are often asked. Also, prepare for questions on family law, legal maxims, important judgments, and IPR based basic questions. Questions are basic and interesting. When it comes to legal reasoning the best part is that you do not need to prepare but just apply the principle to the fact and you're done hence the name of the section "legal aptitude". Also, prepare for this legal section by going through basics of Indian Penal Code. Another very important aspect of this exam is time management. The first way to judge your speed is that you must take a mock test under exam-like conditions with no distractions and no getting up midway. Second step which will improve your speed is taking sectional tests. Last of all let me give you a time frame for each section which can be your guidepost about how much time to spare for each section. Maximum time which is half an hour should be spent on legal aptitude, Maths and logical reasoning. For English you should spend around 20 minutes, and on GK you should spend 10 minutes. Finally, let us talk about how to get used to online format of taking the exam. Good news is that online exam makes it faster to navigate between questions. Also, the question paper has different colors for attempted questions and those questions which are unattempted and questions to be reviewed. Another benefit of an online paper is that you can change your answer any time before submitting the paper and you also save time which in an offline paper you would have spent in marking the ovals. Before I conclude I would like to give you some very important tips which are that mocks are important from three points of view. One is because you get to know where you stand vis a vis national competition, second you get to know if you are falling short of time and third of all you get to find out your strengths and weaknesses which helps you improve your score with every passing mock test. Next important thing is that you should solve the past year papers of last five years at least and you should aim for solving ten past year papers. This gives you a realistic idea of what to expect in the paper and what the paper pattern looks like. Plus, sometimes questions get picked up as it is from previous year papers. Revision is important. Each week should have a day which should be set aside for revision and improving your weaknesses. This means that the areas in which you find yourself lacking on the basis of mocks and past year papers should be improved during this one day. If one day is not enough then spend 2 days but it is a must to solve doubts and better your score with each mock test. Moving to the last part which is admission procedure, application process and form filling. This process can be time consuming and complicated and might take up precious time therefore set reminders and seek help from a friend who is also applying or from one of your mentors from the coaching institute. Last of all one should remember that this exam has negative marking which is something we discussed before so to avoid losing out due to negative marking one should avoid taking wild guesses and mark an answer when one is almost sure of the answer. Devise a strategy which works for you on the basis of analysis of your mock test negative marking. The conclusion is that CLAT is an exam which is of medium level toughness and can be cracked with relative ease with a preparation of 6 months but it should and cannot be taken lightly. A score of around 130-150 should get you a place in the top tier NLUs and that should be every aspirant's aim. Staying calm is important, taking breaks so as to prevent a burn out is important and a hobby which takes away stress is important too. By being calm, doing smart study and regular dedicated hard work one can attain the target and get a seat in a good national law school and carve a bright future for oneself. Go through exam tips shared by toppers for CLAT Preparation and find out how you can clear CLAT 2018.